It was a packed room at the April conference of the Midwest Broadcast Journalists Association. Starting the dialogue on workplace integrity began as a challenge. Then, a veteran journalism professor with University of Nebraska Omaha spoke up, admitting that things like discrimination and sexual harassment historically had never been addressed. “That’s going to change on Monday,” the professor told the group, of his plans to take the conversation to his journalism students. Susan Ramsett, vice president and general manager with KWQC-TV, which serves the Quad Cities in Iowa and Illinois, remembers the moment well. 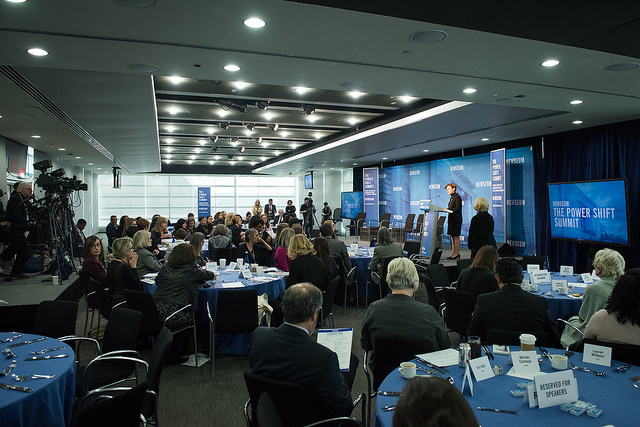 A year ago, Ramsett participated in the Freedom Forum Institute and Newseum’s Power Shift Summit, an event that invited more than 130 newsroom leaders, editors, reporters, and advocates to identify problems and generate solutions to the problem of sexual misconduct in the newsroom. Soon after, the summit released a 21-page report: Ending Silence and Changing Systems in the Media Industry. The report identified seven principles and called for the repair of systemic failures, including the ability to report misconduct without fear of retribution, harassment training for employees at all levels of an organization, and a human resources process free from apparent and inherent bias. Credit: Freedom Forum Institute power shift summit, Jan. 2018. You could say that first summit was the eye of the storm — filled with rage about how sexual misconduct had flown so far below the radar in the country’s newsrooms. What followed was a solid year of self-examination and attempts at improvement. The Freedom Forum continues to lead its charge in this fight, graduating last June a class of 33 trainers certified to teach a workplace integrity curriculum to news organizations nationwide. This year, the Freedom Forum has workshops planned in March, June, August, and October. On Dec. 14, CBS Corp. awarded the institute with a $500,000 grant to expand the reach of its workplace integrity training. KWQC-TV’s Ramsett says it’s crucial for the media industry to have workplace integrity. Credit: Freedom Forum Institute – the inaugural first class, June 2018. Top row (from left to right): Marty Kaiser, Jennifer Legat, Margaret Holt, Karen Raffensperger, Rebecca Feldhaus Adams, Sharahn Thomas, Susan Ramsett, Mizell Stewart, Shirley Carswell, Lynne Adrine. Middle row (left to right): Kat McKibben, Sonya Gavankar, Sharon Masling, Katherine Ellis, Jan Neuharth, Jill Geisler, Cathy Trost, Jan Goldstein, Kathleen Culver, Candy Altman, Roseann St. Aubin, Karen Testa. Front row (left to right): Madhulika Sikka, Kate McCarthy, Elisa Lees Muñoz, Julie Moos, Jen Christensen, Traci Schweikert, Jean Hodges, Kim Vance, Diana Miller, Maryfran Tyler, Cindy Keith, Sandra Porteous. Jean Hodges has worked in newsrooms for many years. 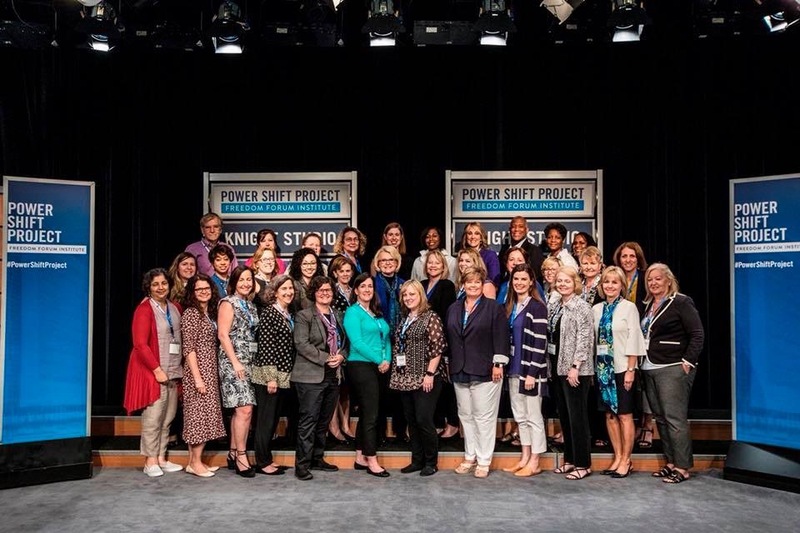 Hodges, senior director of content with GateHouse Media News & Interactive Division, found the power shift program inspiring — the idea of making things better for newsrooms. She wanted to start the conversation, applying the workplace integrity curriculum within GateHouse — this very specific critical thinking that goes beyond general compliance training. GateHouse Media is among the largest publishers of locally-based media in the U.S. According to its site, GateHouse publishes 145 daily newspapers, 325 community publications, and more than 555 local market websites that reach more than 23 million people every week. Hodges already has two trainers in the Freedom Forum program. The goal is to permanently keep the workplace integrity conversation alive within GateHouse Media. In related news, the Freedom Forum announced on Jan. 25 the sale of its headquarters at 555 Pennsylvania Avenue in DC to Johns Hopkins University for $372.5 million. Johns Hopkins will use the facility for its DC-based programs. While the sale still is subject to a number of regulatory approvals, the museum plans to close at the end of 2019. “The sale of the building will not effect the program,” said Sonya Gavankar, director of public relations with the Newseum.